Where is the little boy who looks after the sheep? He's under the haystack fast asleep. What does the phrase 'Little Boy Blue' conjure up for you? Is it the classic nursery rhyme (above) or maybe you are thinking of the well-known painting by Thomas Gainsborough - The Blue Boy? For me now the phrase will always bring to mind a highly successful hand-knitted jumper - something neat, masculine, retro, delightfully textured and vaguely hipster. Half the fun of a new project is naming it. This jumper is the first one I have made my son since he was a little baby in nappies. 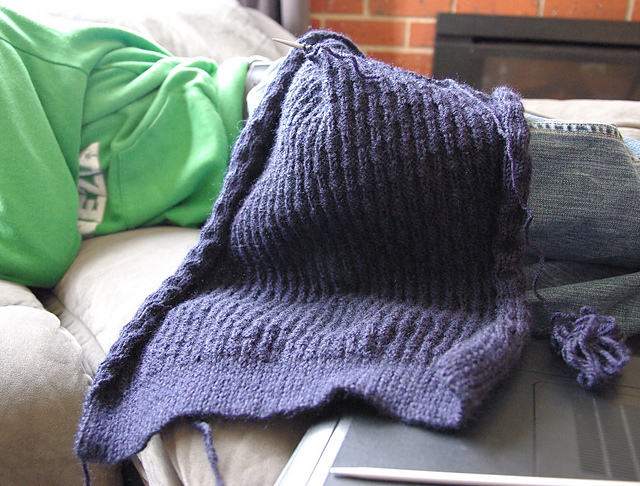 In hindsight, waiting to knit the boy a jumper until he was a full grown adult sized male was probably a little bit of a silly idea in terms of the amount of work involved. This jumper began its knitting journey at Easter this year. Whilst the boy was home from Uni for the Easter break we stash dived and liberated some woolblend yarn gifted to my stash at least 10 years or so ago though I think it was originally purchased sometime in the dim dark 1980s. This rich navy blue always reminded me of the school jumpers of my youth and was never something I would consider using myself. But it was what the boy chose and looking at the finished garment, it was an inspired choice on his behalf. Then we had to choose a pattern. We hunted patiently through my embarrassingly huge collection of knitting magazines and trawled the Ravelry database the boy having previously exhausted the archives of Knitty. 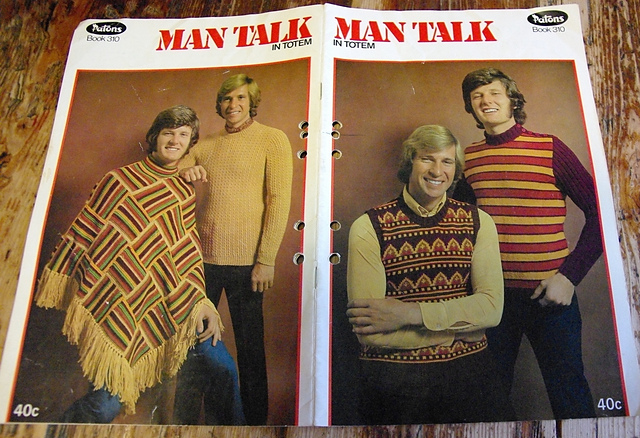 In the pile of classic knitting pattern books, we found this absolute gem from the 1970s. Despite the lurid bad taste of the cover, the other designs are simple, classic and elegant. 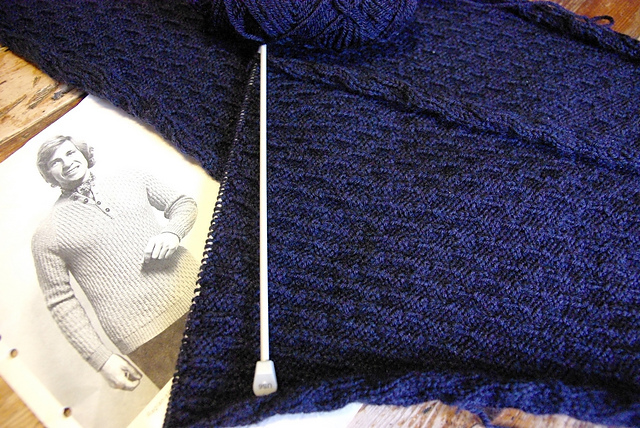 We swatched for bit and eventually chose the imaginatively named Jumper No. 3. I measured the dimensions of the boy and packed him back off the University. I started this jumper with the sleeves. Sleeves make great public transport knitting. These sleeves did train journeys, long distance car trips and helped me cheer on the eldest daughter at her cheerleading competition. 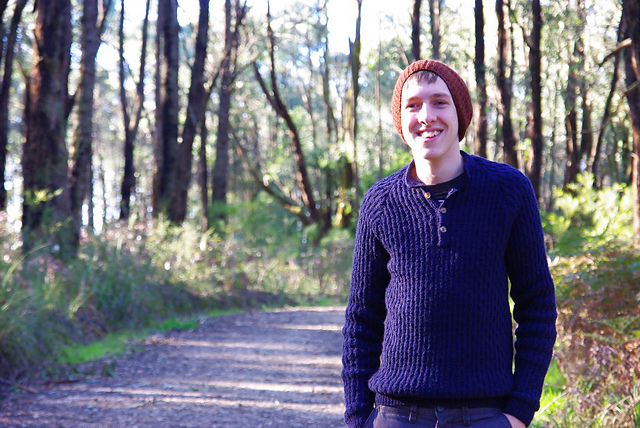 It was great fun to knit, a deceptively simply pattern that flowed off the needles. (But I kept being unfaithful and knitted on other projects instead). 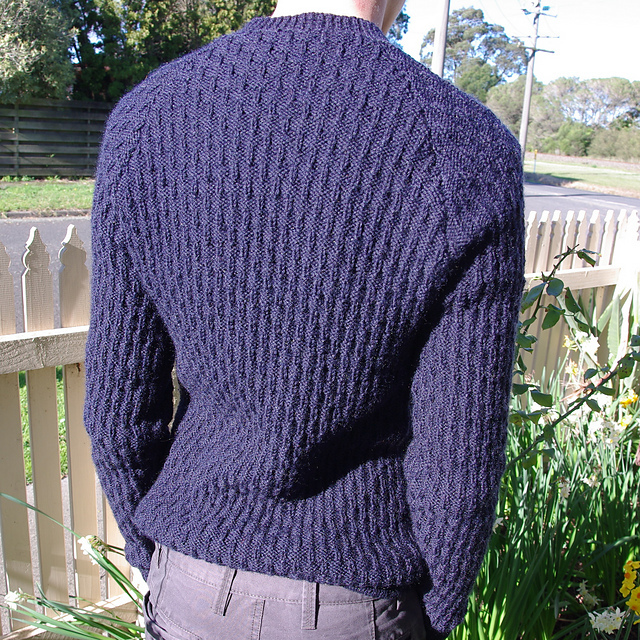 But a few weeks ago, the realities of a cold wet, Victorian winter began hitting home and boy bet me that I couldn't finish his jumper in a week. He was coming home for the weekend and pleaded for it to be finished by the time he was ready to go back. So I took stock. I had done both the sleeves and half the back. I put on my speed knitting skates and off we went. It did help that the Commonwealth Games were on and that there is just such a wonderful knitting synergy between excessive sport on TV and productive knitting time. Maybe not under a haystack! But definitely fast asleep. Saturday afternoon couch napping. I admit it wasn't looking promising. It was Friday night and I had the back finished but the only the band of the front. But I knuckled down. The needles fairly flew and by Sunday morning I had the neck band and the finishing / sewing up to go. The buttons are from my grandmother's button collection. 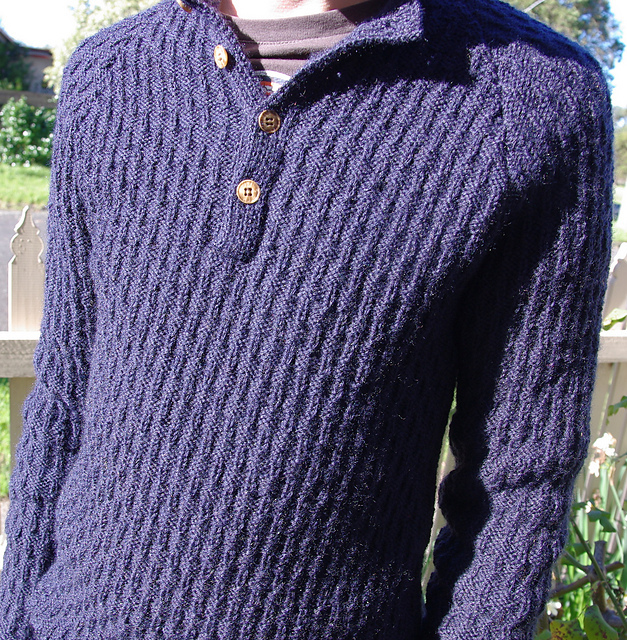 This has to be my most successful knitting project for ages. It fits the boy like a glove, he loves it and it looks like it could be a bought one. I used up almost all of the 9.5 balls of wool I had in my stash. I leave you today with a gorgeous shot of the boy full dressed in knitwear by his mother. I love the beanie too.